Here are some things that might interest those of our guests who hail from a region other than Central Oregon! A LITTLE ABOUT BEND: The VisitBend.com website is a very good source for all things Bend. You can even request a Bend vacation guide. Historically, Bend was originally called "Farewell Bend" and was a resting point for pioneers heading west. In 1905 the "Farewell" part was dropped and Bend became a city centered around logging and mills. Bend prospered because of two large lumber mills, one of which is still standing and currently a popular shopping area. 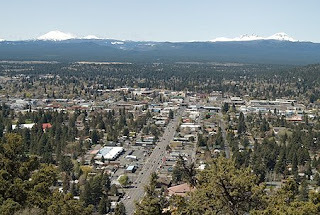 Bend is surrounded by the mountains in the Cascade Range (most notably Mt. Bachelor), by lakes, by the Deschutes river, and by vast forests. 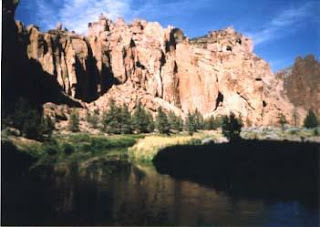 Bend's elevation is around 3,600 feet above sea level and has around 75,000 inhabitants. The area is considered to be in a high desert, so the climate is usually mild and dry with snow in the winter and sun in the summer. Temperatures can usually drop pretty low (45F) in the evenings during the summer, so make sure to pack a light jacket or sweater. WHAT TO DO THERE: Hiking, biking, running, swimming, rafting, and fishing are only a few of the many things to do in Bend. Cultural activities include a trip to the High Desert Museum, a wonderful museum which focuses on the wildlife and culture of the central Oregon region. It has more than 100 types of wildlife, such as porcupines, birds of prey, otters, a lynx and bobcat, as well as exhibits on the Oregon Trail, homestead life in the 1880s, and mining. I highly recommend visiting for half a day or so. For families with young children--or just the young at heart--the Working Wonder's Children's Museum would be a good option. Although I have never been there, it looks like a lot of fun. An unusual experience that offers a lot of fun for the whole family is spelunking in the Lava River Cave. It is a mile long and cold, but very fun and interesting. I will defer to the Visit Bend website for more information about outdoor activities, restaurants, and shopping. Or you can check out the article on Bend from Wikipedia. 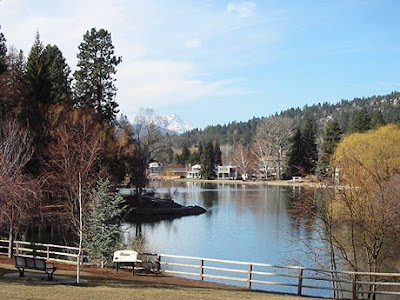 A LITTLE ABOUT SUNRIVER: The Sunriver Chamber of Commerce is a good authority on all things Sunriver. The resort town of Sunriver is located about 20-30 miles south from Bend and is made up almost entirely of personal homes and homes to rent. 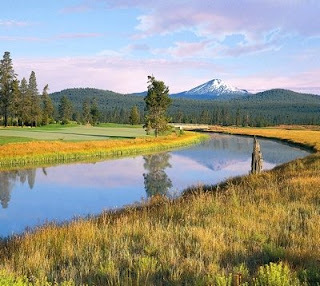 There is the Sunriver Resort, which offers elegant lodging options as well as a very fine restaurant. Sunriver boasts two golf courses, a nature center, an observatory (wonderful for star gazing), horseback riding, canoeing, kayaking, bike trails and two pools (one with a sweet waterslide). If you are staying in Sunriver, I would recommend a long bike ride on some of the many bike paths throughout Sunriver. A little trip to the "Sunriver Mall" is always fun and there you can browse through lots of little boutiques and souvenier shops. Goody's candy, ice cream and soda fountain is always a fun place to stop and buy something sweet. There is also a small mini-golf place in the mall.